The 16TL Angler is designed for a tiller outboard motor up to 40HP. 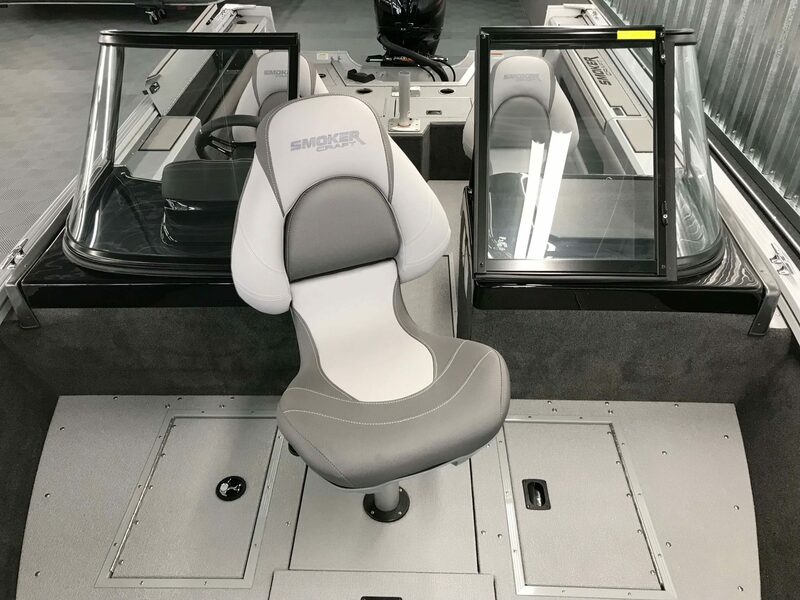 Eliminating the steering council or dual council allows for extra space for fishing, tackle, equipment, and even your cooler and snacks for the day. The 16TL Angler comes standard with 21-gallon fresh catch livewell in the bow of the boat. 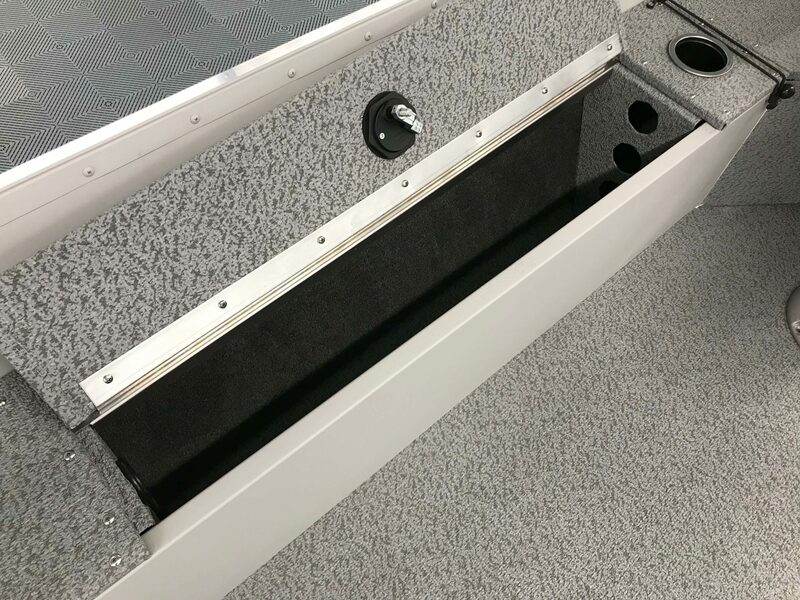 In addition to the livewell, the 16TL Angler comes standard with a port side rod storage compartment for up to 6’ fishing rods. 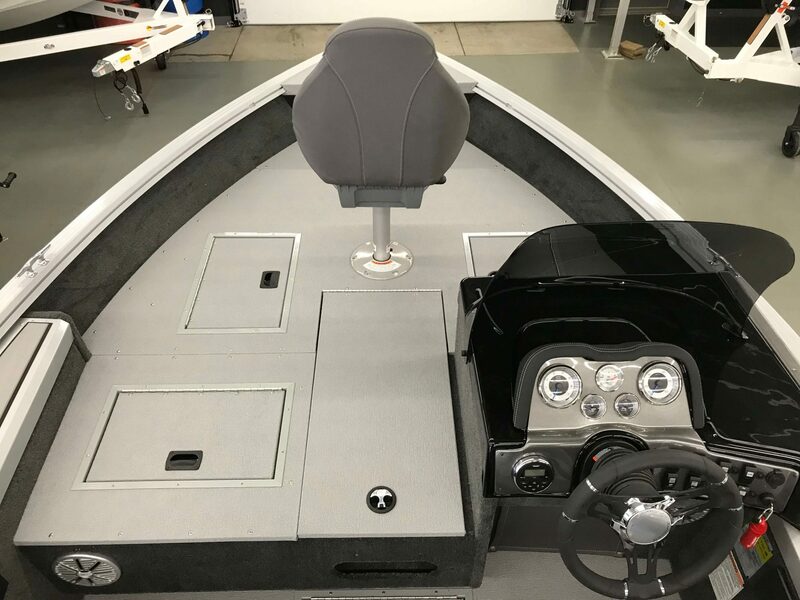 Equip the boat with your choice of trolling motor with quick disconnect and a sonar fish finder and you have yourself the ultimate fishing package for all inland lakes. Fuel Capacity (gal.) - 22 gal. The all-new 160 Adventurer is designed for a tiller outboard motor up to 70HP. 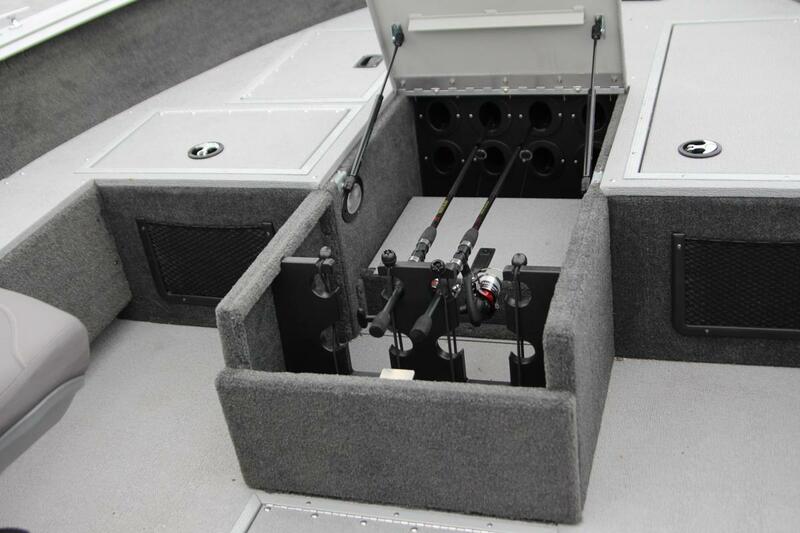 Eliminating the steering council or councils turns this 16-foot fishing boat into an open layout for all pro anglers. The 160 Adventurer comes standard with lockable sub-floor and center rod storage for all of your favorite fishing rod/tackle setups. 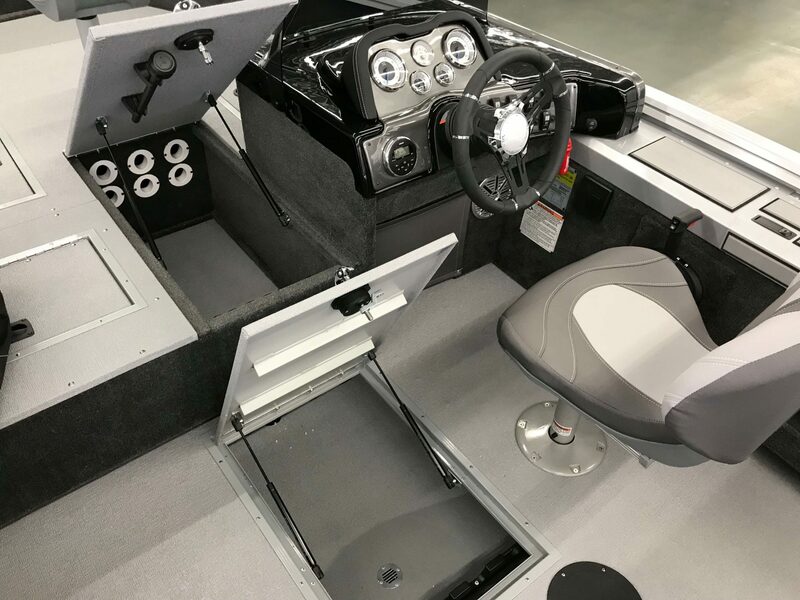 For the pro anglers fishing the tournaments, the boat comes standard with the FreshCatch stern livewell and Integrated Gunnel Track System for your rod holders, tool holders, and even cupholders. 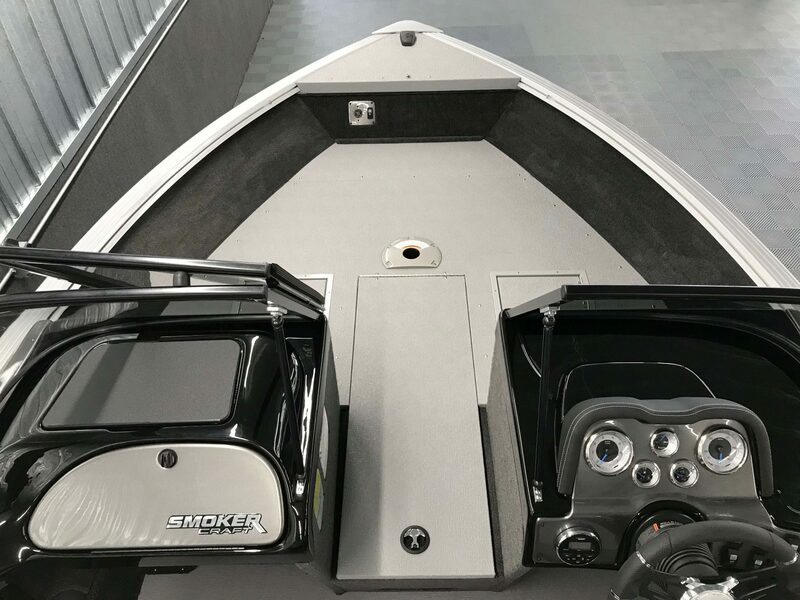 Equip the boat with your choice of trolling motor with quick disconnect, sonar fish finder, and a Bert's Custom Tackle Package and you have yourself the ultimate fishing package for all species. 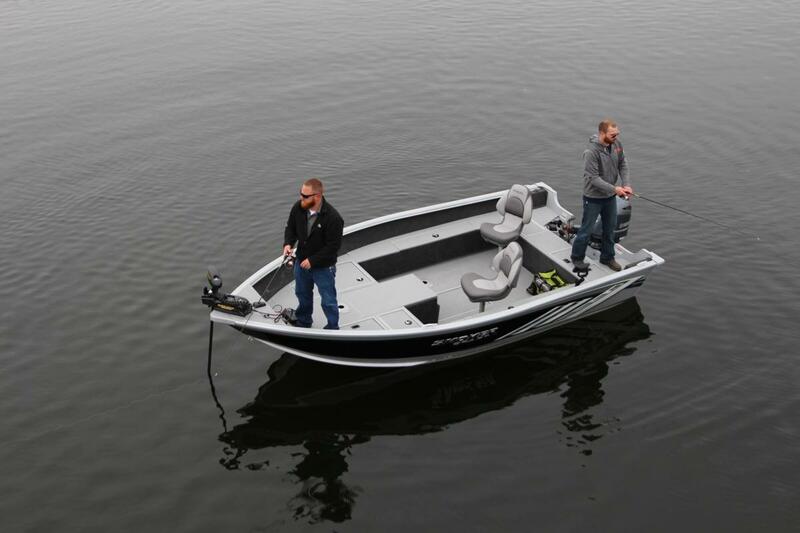 The 161 Pro Angler XL is the smallest fishing boat in the Pro Angler XL Series. 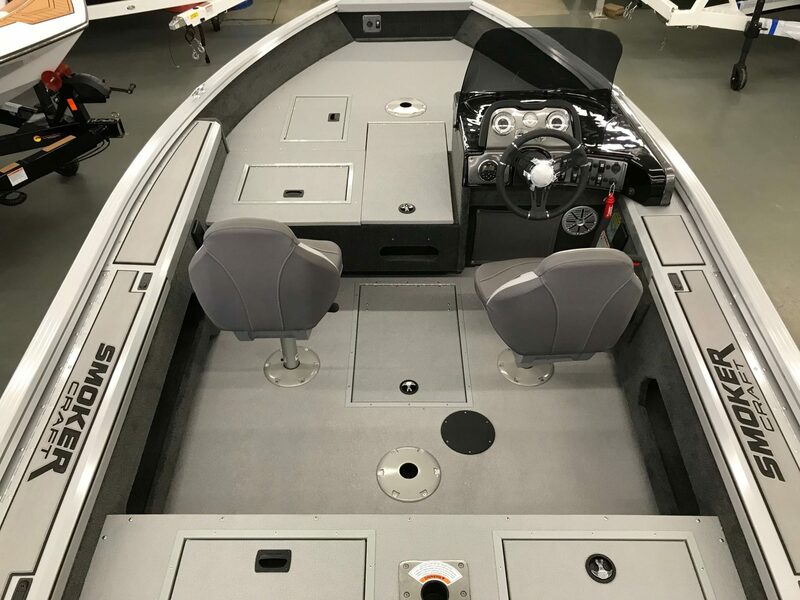 But, the deep and wide hull is designed to provide a spacious fishing experience that other 16-foot fishing boats struggle to achieve. The large bow and stern casting platforms allow for two livewells (40 gallons total) in which most 16-foot fishing boats have only one livewell. 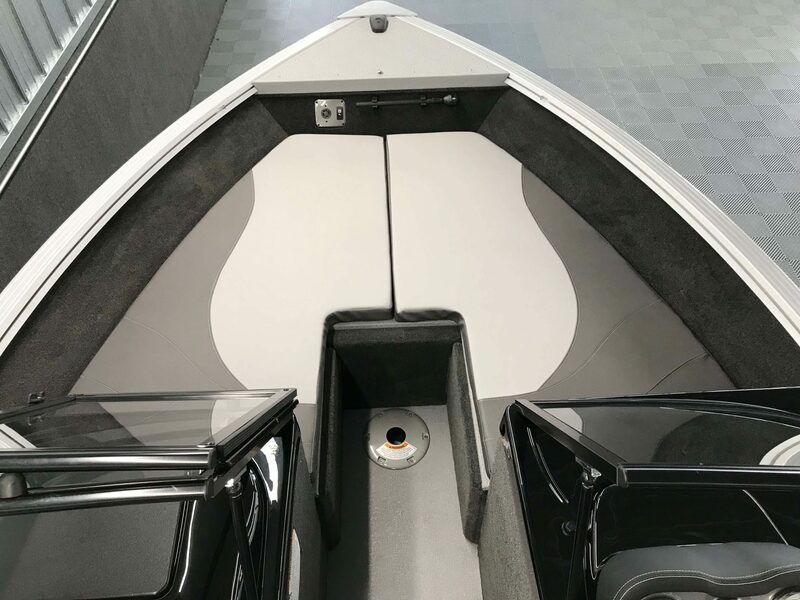 It’s also important to note that the entire boat is finished with an eye-catching, yet durable vinyl flooring for easy cleanup after a long day out on the lake. Equip the boat with your choice of trolling motor with quick disconnect, sonar fish finder, and a Bert's Custom Tackle Package and you have yourself the ultimate fishing package for all species. The 172 Pro Angler XL is our most popular fishing boat in the Pro Angler XL Series. 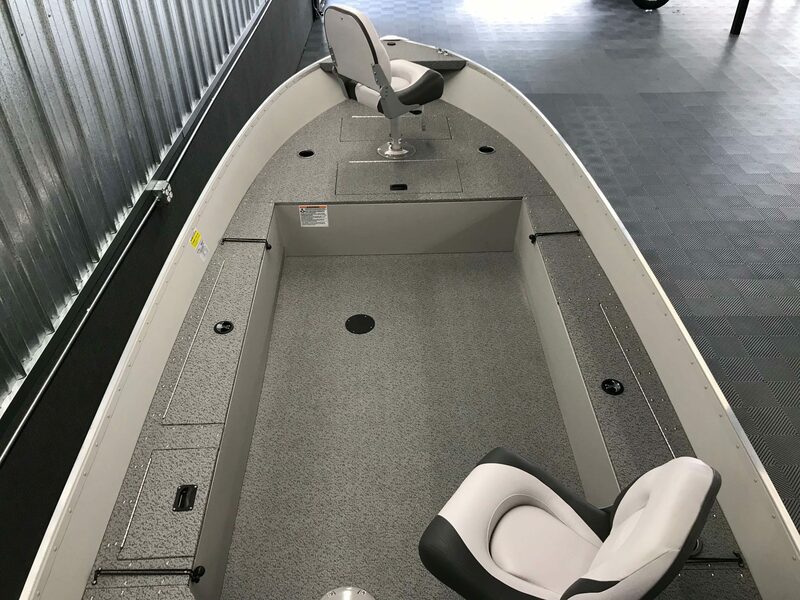 Coming in at 17-foot 3-inches in length with a beam width of 8 feet, the boat makes for the perfect size for a variety of different bodies of water. 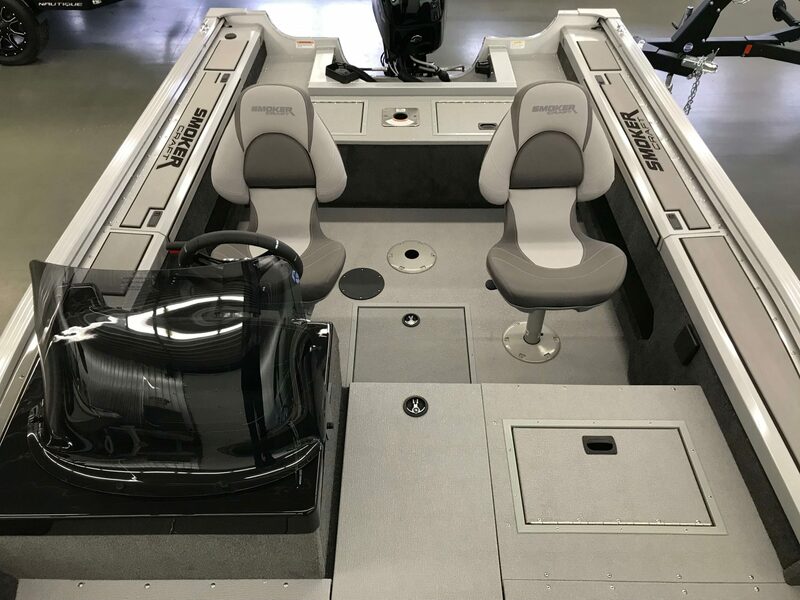 Unlike the 161 Pro Angler XL, the 172 Pro Angler XL has a dual console with a complete windshield. 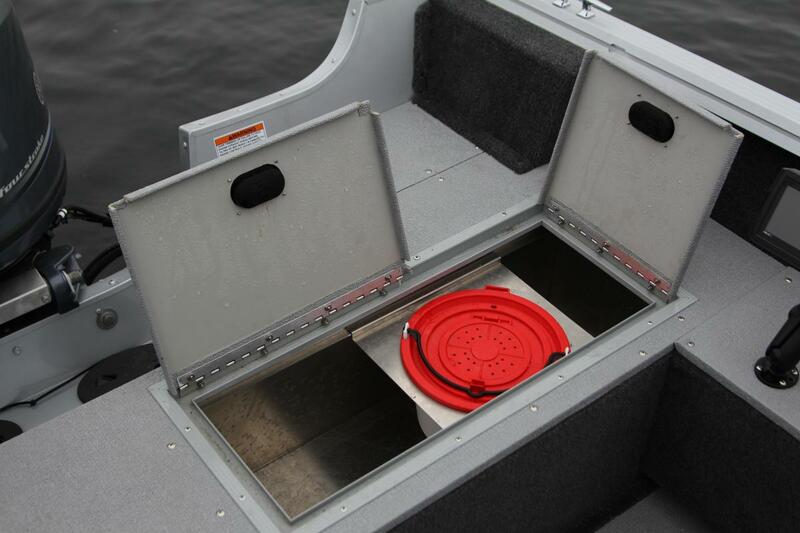 This feature is most applicable during those late-season fishing adventures and/or to shield your crew from the battle of the storm. Add up to a 150HP engine into the mix and beat that storm ALMOST every time! 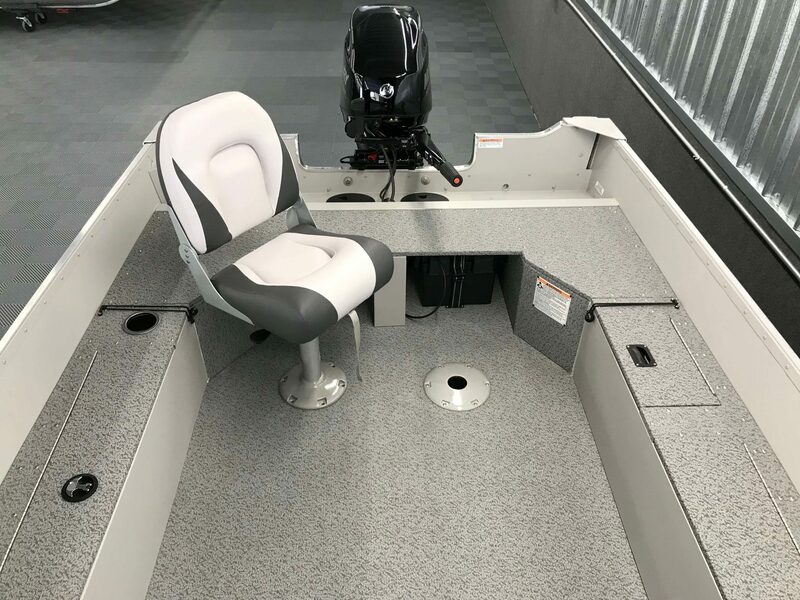 It’s important to note, the 172 Pro Angler XL comes standard with 3 deluxe movable fishing chairs with 6 pedestal options for maximum comfort and versatility. 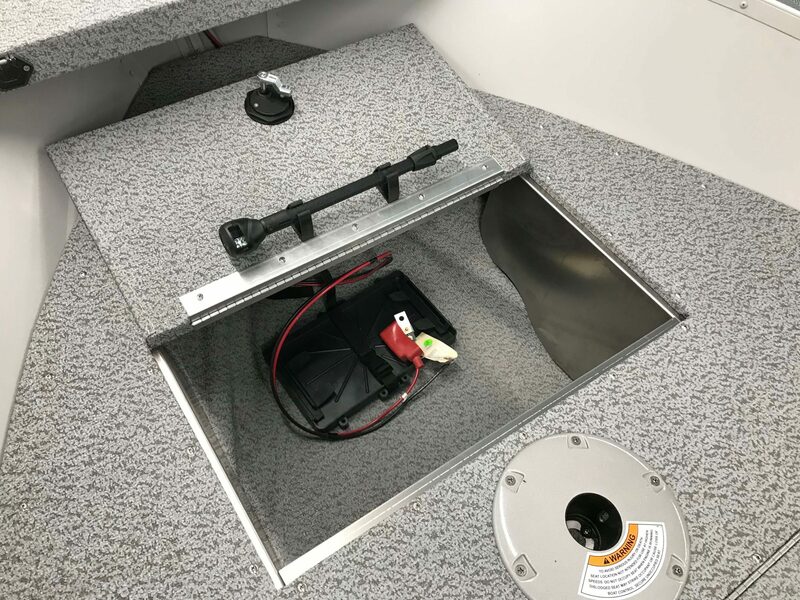 Equip the boat with your choice of trolling motor with quick disconnect, sonar fish finder, and a Bert's Custom Tackle Package and you have yourself the ultimate fishing package for all species. Fuel Capacity (gal.) - 25 gal. 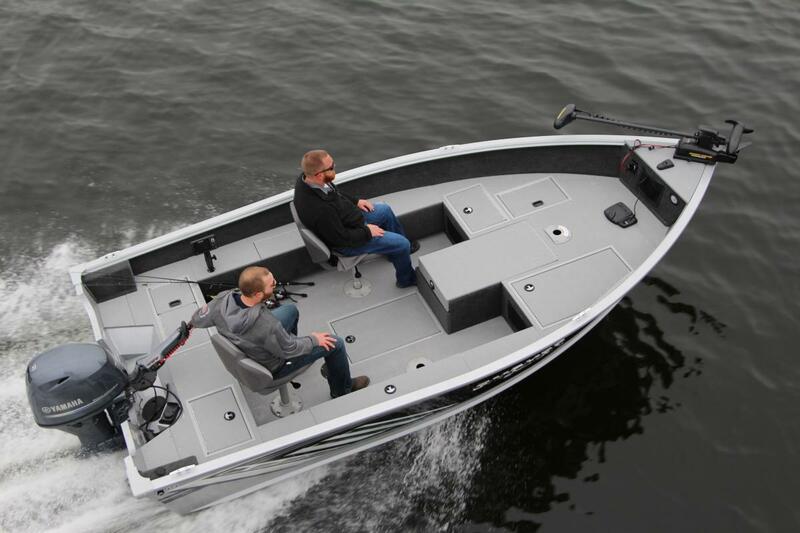 The 182 Pro Angler XL is the largest fishing boat in the Pro Angler XL Series. 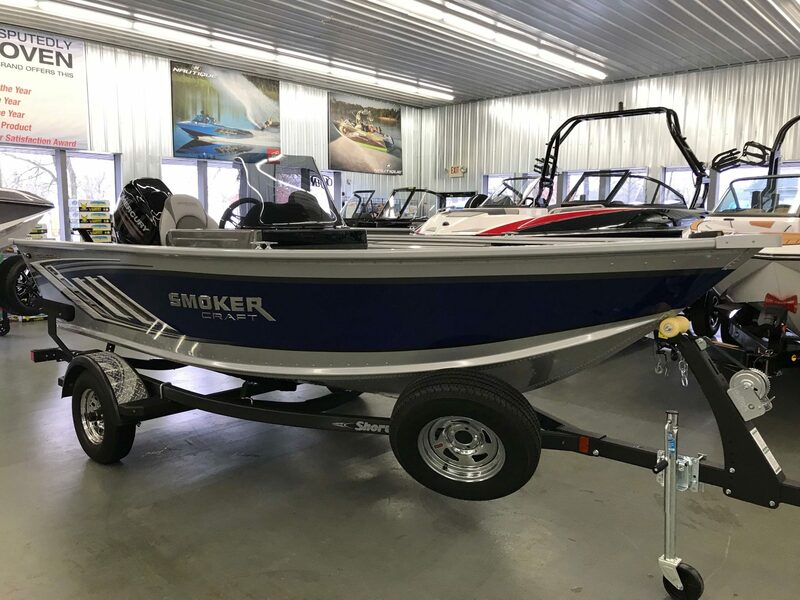 Coming in at 18-foot 2-inches with a beam width of 8-feet, the boat makes for the perfect walleye boat for larger and smaller bodies of water. 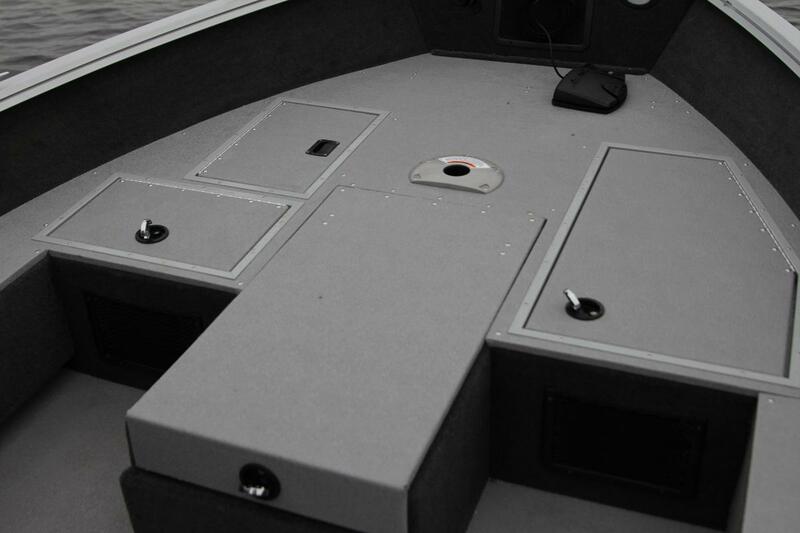 The boat comes standard with a remarkably large bow and stern casting platform. 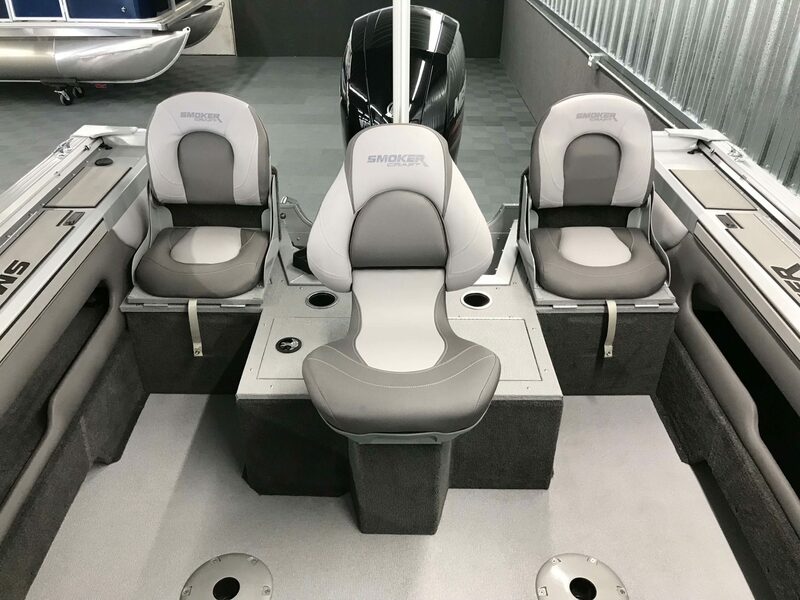 Add the Split Flip-Up Bench Seating and you now have versatile seating comfort as well as an additional extension to the stern casting platform. 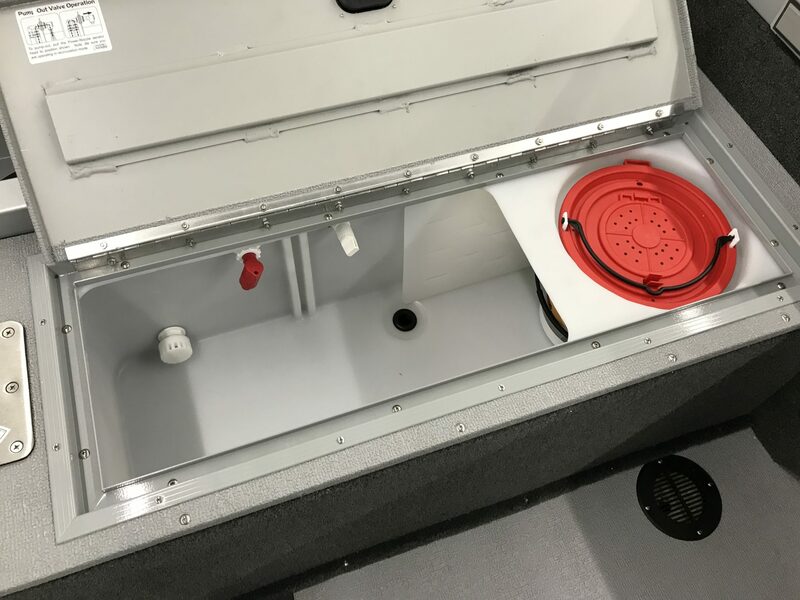 In addition to the abundance of fishing space, the 182 Pro Angler XL is equipped with boatloads of dry storage compartments. Starting with the top loading gunnel fishing rod compartments, and working forward to the in-floor, and center bow fishing rod/storage compartments, the 182 Pro Angler XL guarantees a home for all of your favorite rod and reels. Equip the boat with your choice of trolling motor with quick disconnect, sonar fish finder, and a Bert's Custom Tackle Package and you have yourself the ultimate fishing package for all species. The 182 Ultima is the ultimate fishing boat for families in which are looking for multi-purpose versatility. Pack the cooler with snacks, grab the ski’s, tube, and wakeboard for a long family day out on the water. Load the boat up with your fishing rods, tackle boxes, and equipment for an early morning fishing trip. No matter what you and your family plan to do, the 182 Ultima is guaranteed to accommodate. 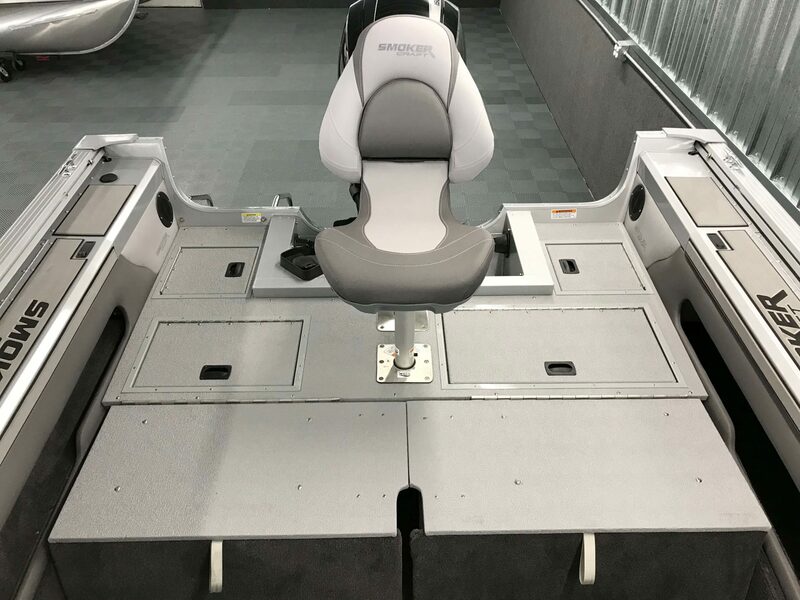 The 182 Ultima comes standard with two flip-up jump seats integrated into the stern casting platform. This allows for a spacious layout with extreme comfort and versatility. 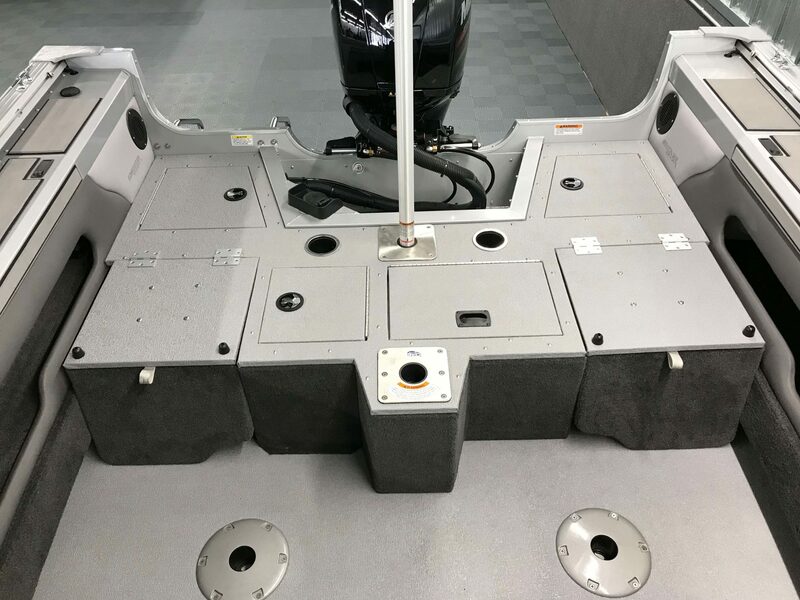 The bow of the 182 Ultima also comes standard with a bow walkthrough which is equipped with a convertible floorboard to create a complete casting platform with tremendous storage. 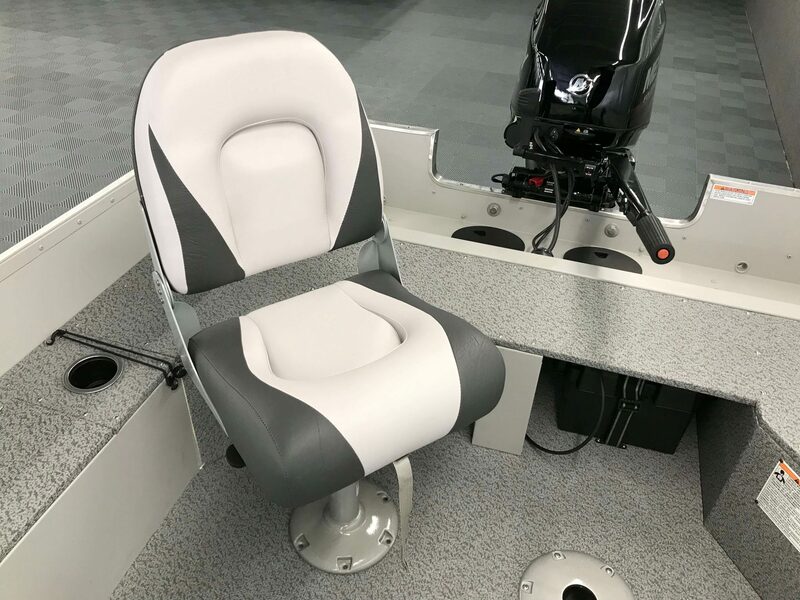 The convertible bow layout also includes an additional flush mount pedestal location for a fishing chair. 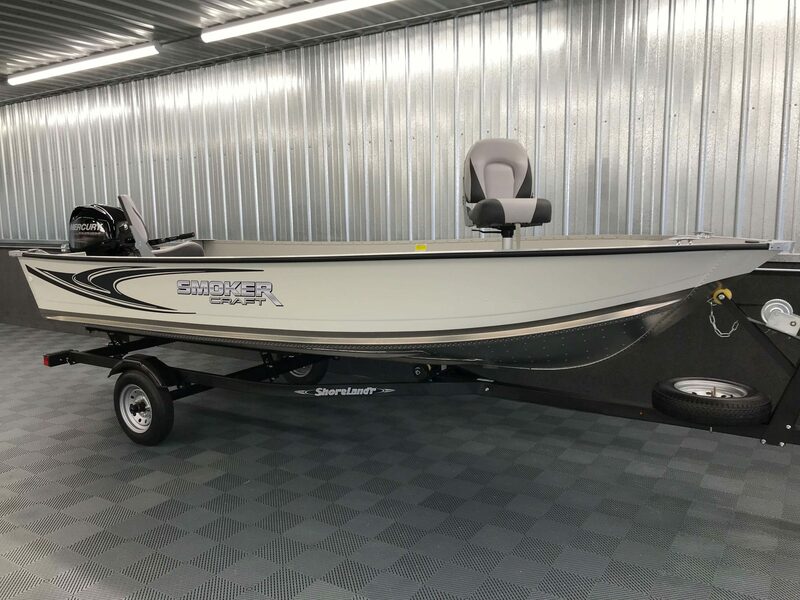 Equip the boat with your choice of trolling motor with quick disconnect, sonar fish finder, and a Bert's Custom Tackle Package and you have yourself the ultimate fishing boat with multi-purpose versatility. 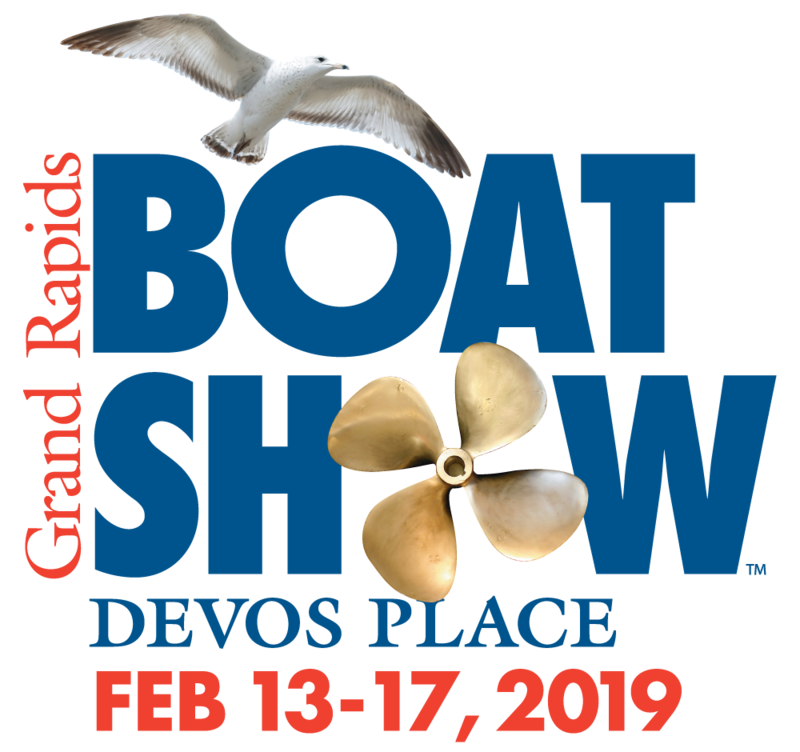 You’ve now made your decision to attend this year's Grand Rapids Boat Show. You've purchased your admission tickets and the entire family is already excited for next summer on the water. The day of the boat show has arrived and may create an overwhelming experience. But it doesn't have to. Following these important tips and tricks will ensure that your family's visit to the Grand Rapids Boat Show is a major success. Researching before the Grand Rapids Boat Show is what we like to call “doing your homework”. If you have a specific brand your family is interested in, find your local dealer and visit their showroom, either at their storefront or their online showroom. Who knows, you may get to the showroom and find out the brand you were excited about leads you to another brand or layout that better fits your family’s needs. This could save you hours of time at the show, and allow you to spend more time browsing a narrowed list of brands, models, layouts, and even dealerships. Scheduling your family’s visit early in the week makes all the difference when it comes to purchasing the right boat. The attendance on Wednesday, Thursday, and up to Friday afternoon are usually much lower than Friday evening, Saturday, and Sunday. This provides one-on-one sales advice, smaller crowds on the boats, and shorter lines at the concession stand. And if you don’t receive enough information during your visit to make a purchase, you still have the chance to attend another day at the show. But you should know that the boat show incentives only last through the end of the show on Sunday evening. During the second day at the show, your family should have a much smaller list of brands, layouts, and dealerships then during the first day. Dealerships are excited for you to explore the new year's product. Several days are spent making sure the booth provides easy access onto each brands variety of different models and layouts. Therefore, don't be afraid to get onto the boats! Getting on the boats allows you to touch and feel, and to figure out what you like or what you dislike. Upon entering the boat, you may drum-up a long list of questions, don't worry this is normal. And the dealership staff will be eagerly waiting to answer any questions or concerns to which you may have. Your family’s day at the Grand Rapids Boat Show can be a whirlwind. It can be even more difficult when attempting to remember all the product details, brands, layouts, and different dealerships you walked through during your visit. For these reasons, it’s important to collect as many brochures from each dealership as possible. During the show, they can be used to quickly compare brand to brand without going back and forth from boat to boat. On top of that, If your family does not purchase a boat during the first visit, the brochures can be used as a reference point and provide further knowledge for the second day at the show. Another free tool that is used to gain further knowledge is the dealerships staff members. All well-rounded dealerships should have staff members who are beyond educated on the product and everything that has to do with the product. Therefore, it’s important to collect contact information from the dealerships staff members in which you enjoyed working with. Therefore, if your family does not purchase on the first day, the staff member can be contacted and provide all forgotten, or unanswered information for the second day at the show. The words value and price don’t always go hand in hand. This is why it’s important to always request detailed quotes at the boat show. The detailed quote should include manufacture/dealership show incentives, additional options, and any other price-related promises made. 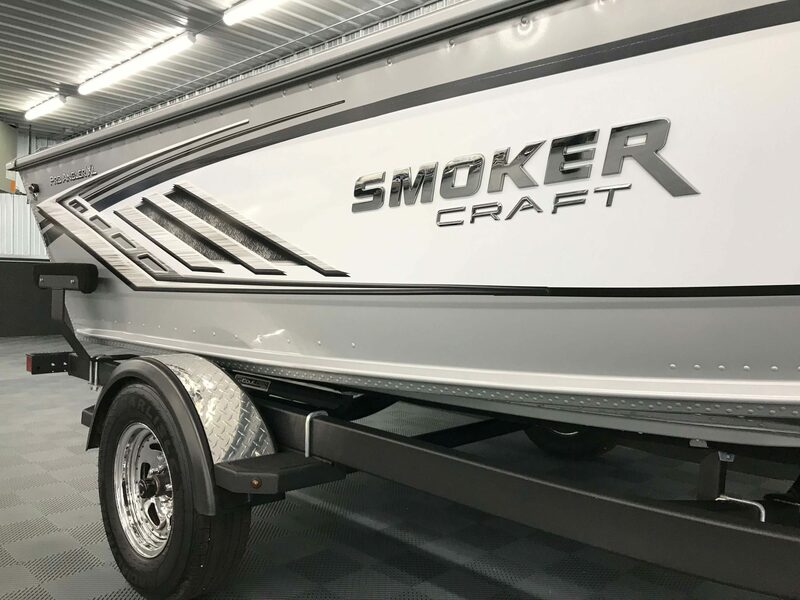 It’s also highly encouraged that you ask what the quoted price would look like if you decided not to make the purchase at the Grand Rapids Boat Show. This price increase could make a difference in which brand, model, layout, and even engine you decide to purchase. Remember to bring a camera or smartphone to help compare different brands, models, options, and features. These images can also be shared with family and friends to further validate your final decision. Now that you have discovered these 5 tips and tricks to help you at this year's Grand Rapids Boat Show, your family WILL have a successful visit. 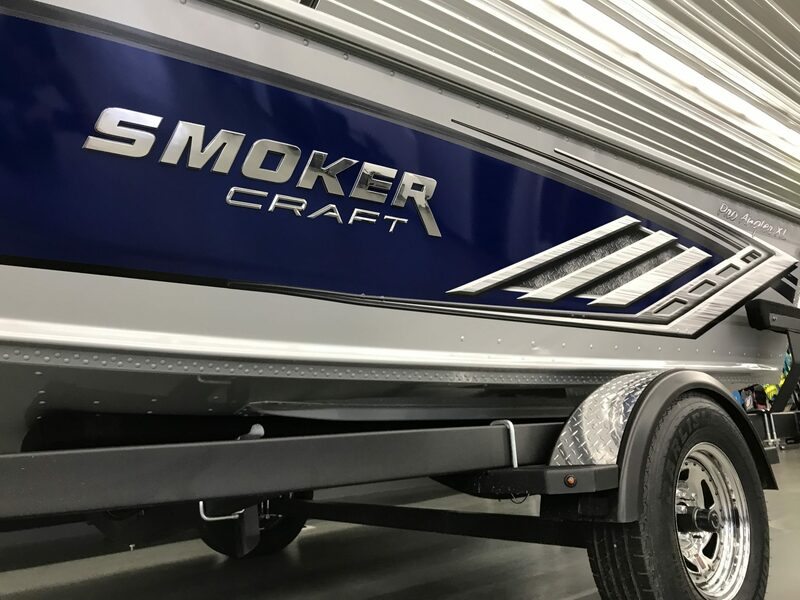 No more dreaming of long days out on the lake with your family. Dreams will become reality! 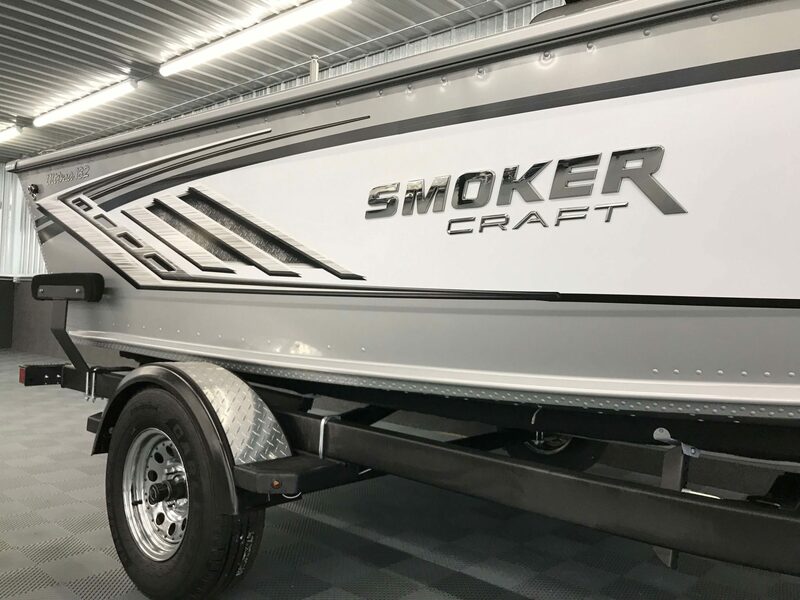 We know this because Premier Motorsports has been a part of the Grand Rapids Boat Show for over 25 years and counting. This year our booth is bigger than ever, and we will have six different boat brands with plenty of different models and layouts for your viewing. 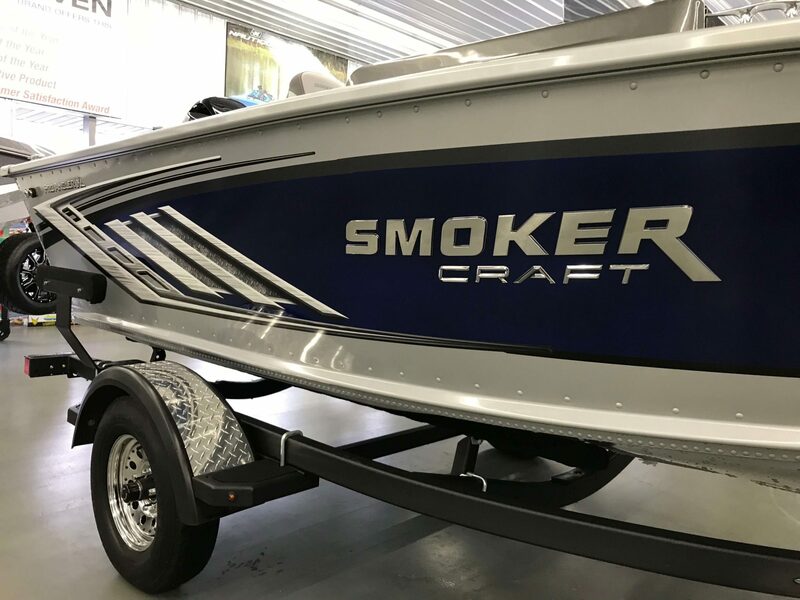 Premier Motorsports carries only the most well known, top of the line brands such as; Sylvan Pontoons, Berkshire Pontoons, Premier Pontoons, Sunchaser Pontoons, along with our two towboat brands Moomba and Nautique. Our entire staff is excited to help you purchase your families next adventure! See you soon. 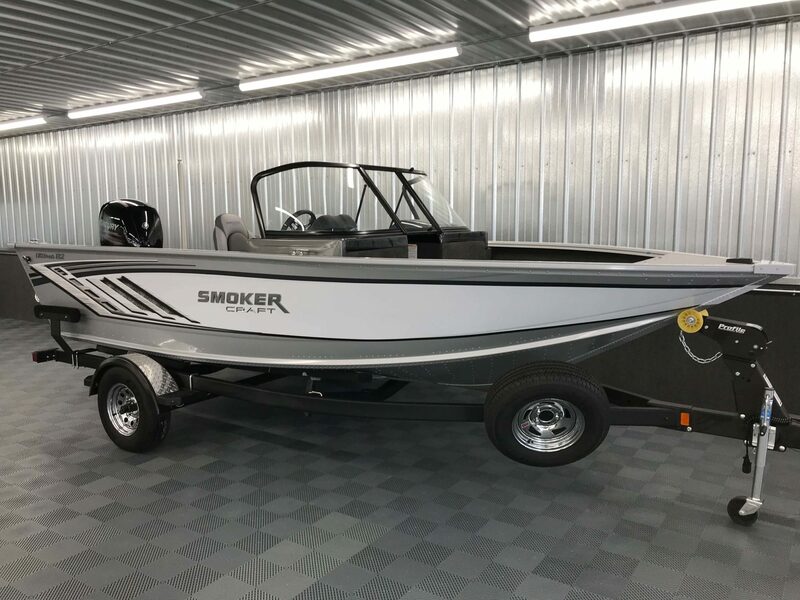 This little big wake boat not only provides massive swells for wakeboarding and wake surfing but also fine-tunes the wake for water skiers as well. 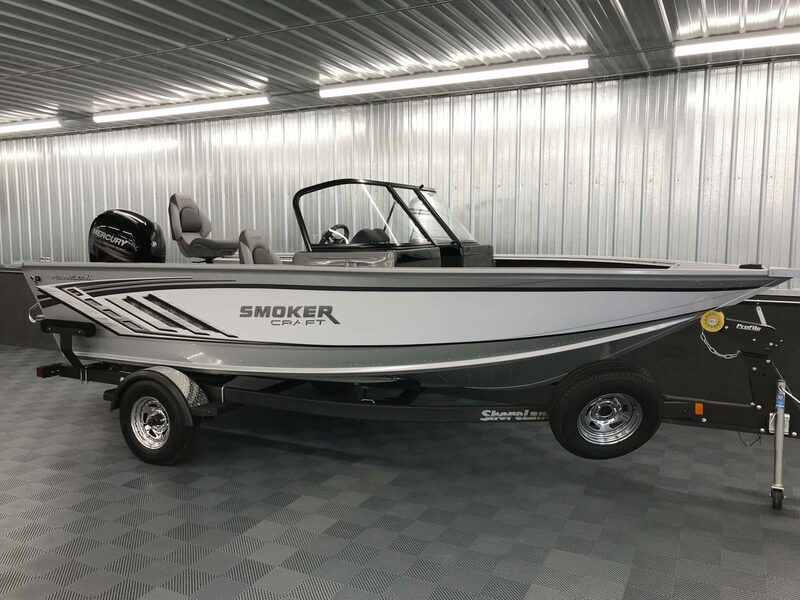 The 2019 Moomba Max is the big brother to the Helix and provides exceptional wakes with maximum comfort and storage. This combination provides endless opportunities out on the water. The 2019 Moomba Mondo is the nimble crossover boat in the Moomba lineup. Producing picture perfect surf wakes, crisp wakeboard wakes, and a flat soft ski run is what this beast does best! The 2019 Moomba Craz is arguably one of the best 22-foot wake boats in the entire inboard/wakeboat industry. The Craz creates wakes for the most demanding riders, while still managing to tame it down for riders who need a less intimidating, but clean wake. 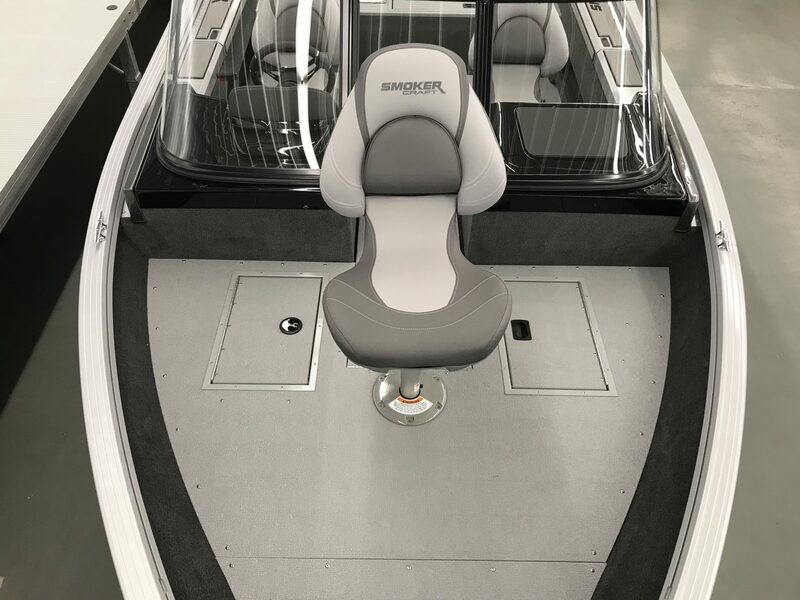 The 2019 Moomba Mojo has a hybrid bow design for spacious comfort and has earned a strong reputation for providing not only best in class wakes, but also taking the rougher waters head-on with its precise handling. 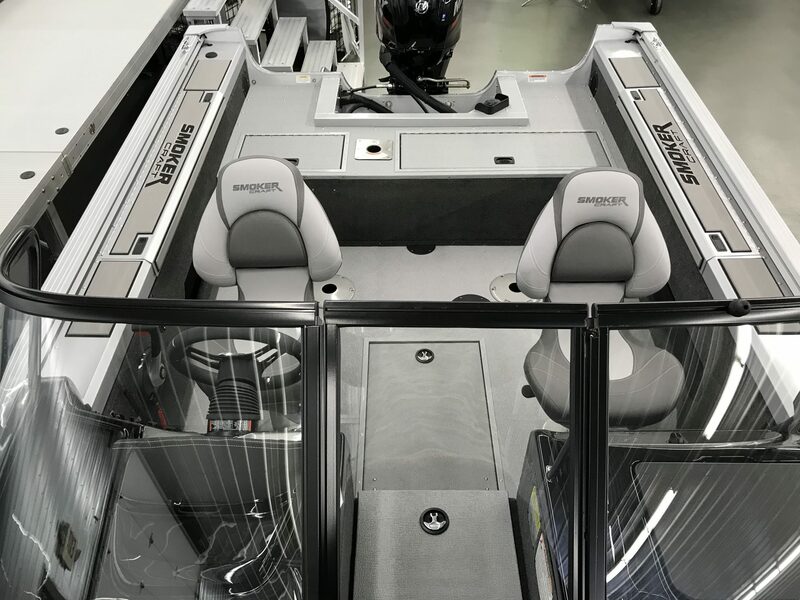 The 2019 Moomba Makai is considered the next generation of Moomba Boats. 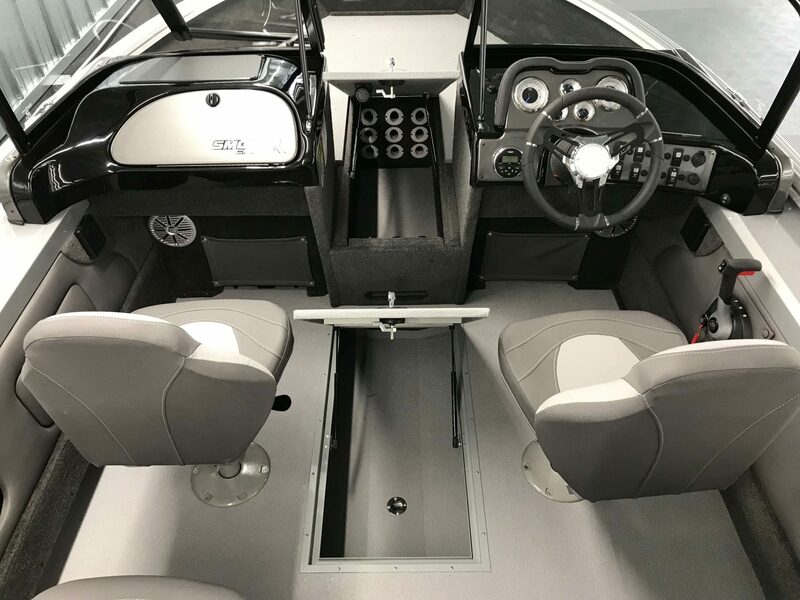 This luxury wake boat is equipped with standard features such as 4000lbs of factory sub-floor ballast, a large walkthrough sundeck, and complete Gatorstep nonskid flooring. The Mondo comes in at 20’6” but due to its non-traditional wide bow design, it feels much larger. 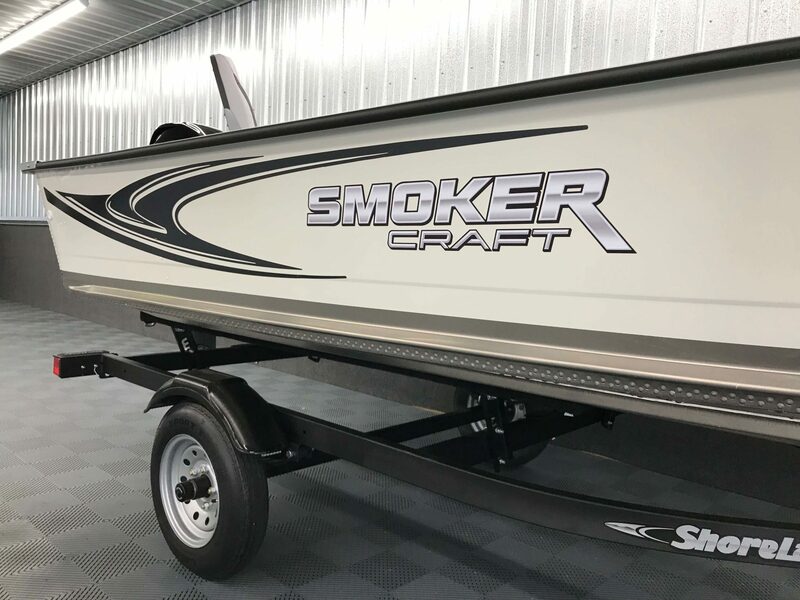 It’s the perfect size for families that garage store or trailer their boat to enjoy their day on the lake. Rated for up to 13 people, this little big boat can comfortably seat 8-10 people and even more if there are small children aboard. Like all of the boats in the Moomba line up, the Mondo provides amazing performance in all watersport disciplines. And in my opinion, it’s the best crossover boat in the entire Moomba line up. 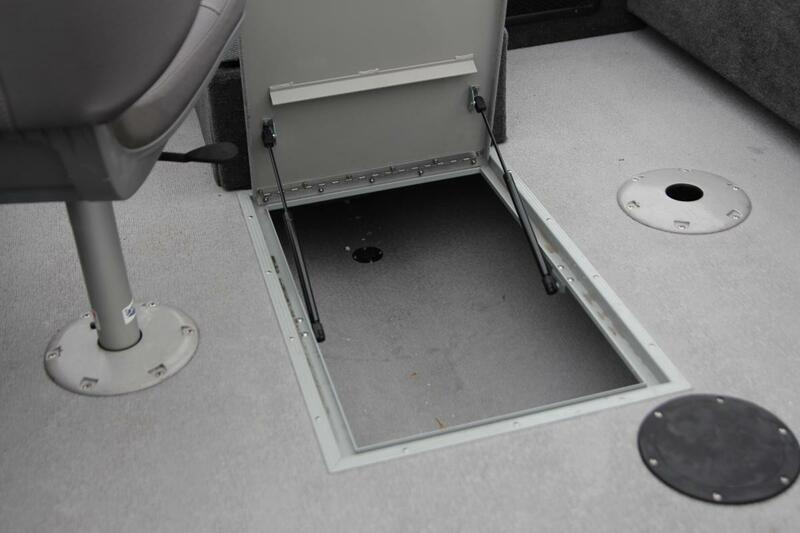 No matter what you and your family do behind the boat, the Mondo can accommodate. Drop the multi-sport wake plate and create soft flat ski wakes or fill up to 2300lbs of factory ballast and throw massive surf and wakeboard waves and everything in between. Unlike other boats in its class, the Mondo comes standard with a 6.2L Ford Raptor engine. This beast of an engine produces 404 ft-lbs of torque and 350HP. So even with full ballast and your entire crew, you will have no worries of having enough power and will be able to more consistently maintain speed. 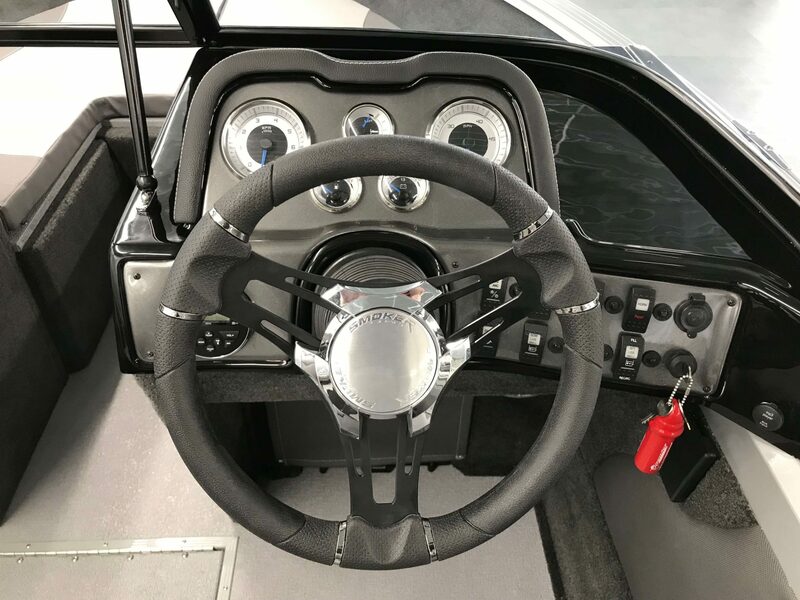 Because this low-end torque monster won't be working as hard or spinning as many rpm’s as a smaller 5.7L engine would, you will spend more time having fun on the water and less time filling up! The motor isn't the only notable standard feature though. The Mondo is packed full of standard features, coming with everything you want and nothing you don't. 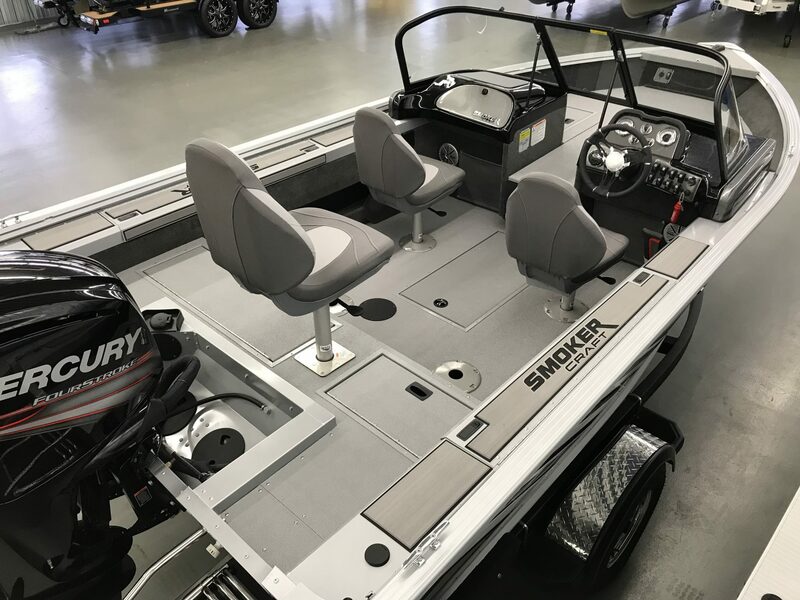 Wet Sounds stereo system, snap-in carpet, sliding rear seat, ski pylon, tracking fins, column-mounted cruise, and wakeplate adjustment switches are just the start to a long list. 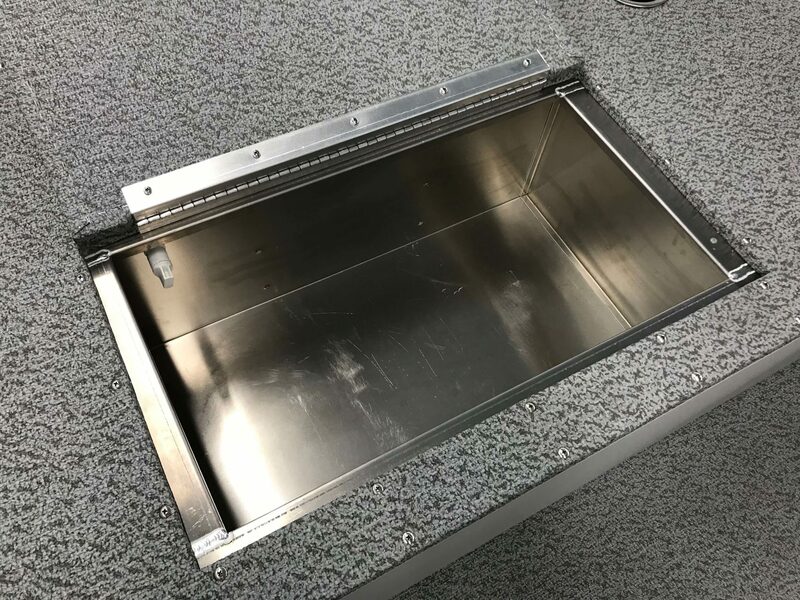 For 2019 you’ll find the dash and glove box area has been completely re-designed. 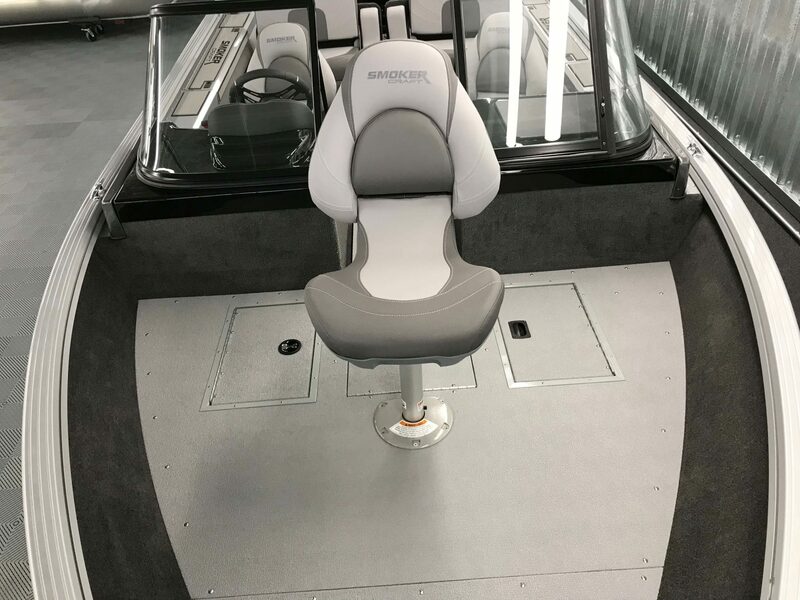 Moomba has upgraded the screen to a 7” full-color touchscreen unit that's offset to the right for better visibility out of the windshield and added a place for your phone. 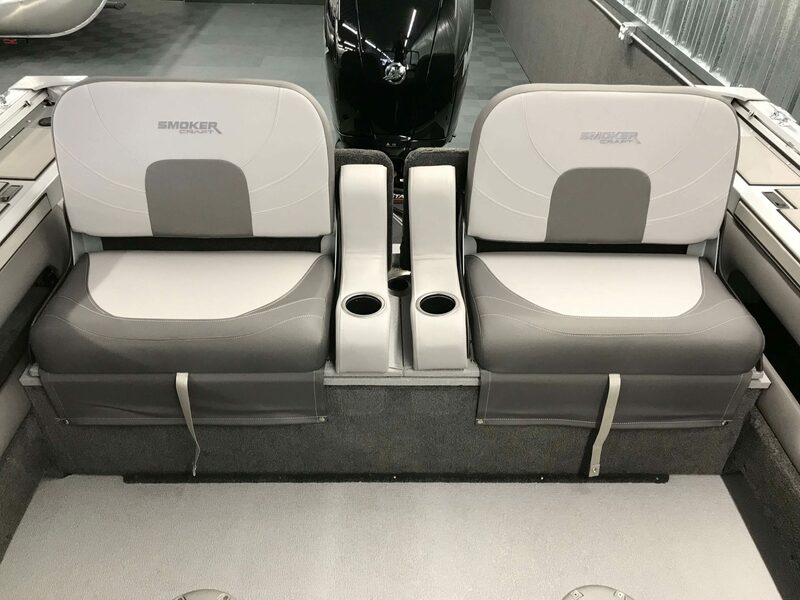 New interior and exterior colors have been added to the offerings as well allowing you to take your customization ability to the next level and really make your new boat your own. Although the Mondo comes with a lot of standard equipment, there are a few options you're going to want to make sure you ask about. Are you into wake performance and want to take your experience behind the boat to the next level? Ask about Moombas patented Auto Wake and Flow 2.0 Surf systems. Into creature comforts? 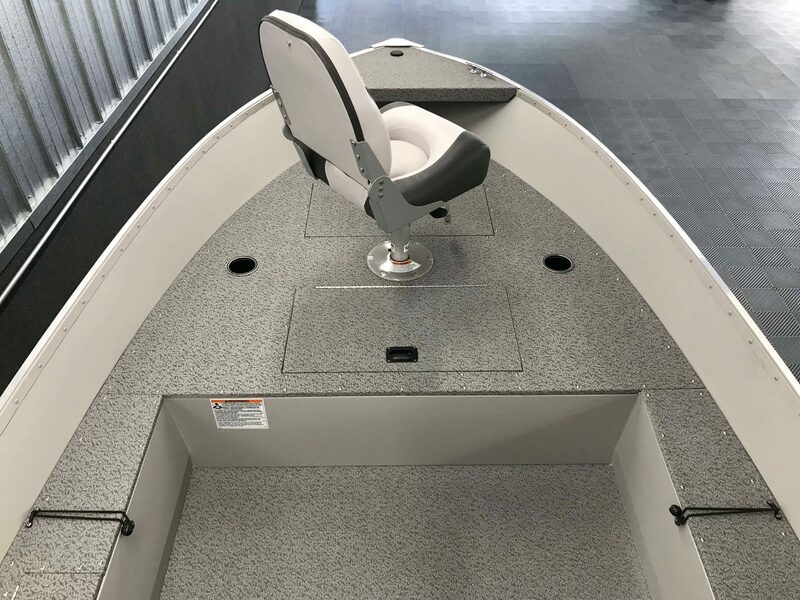 Ask about Gator Step non-skid flooring, swivel wakeboard racks, a backrest kit for the sliding rear seat or a bimini top with surfboard storage. Want to take your audio experience to the next level? Ask about different tower speaker options or about adding a subwoofer. The Mondo truly does it all, sun up to sundown. This brief overview covers just a few of the many reasons why the Moomba Mondo is one of the best selling 20’ boats in its class. Not only at Premier Motorsports but across the entire industry. For more information, be sure to visit our showroom or call and schedule a time for an on water demonstration. We’re here to help make your life… one long weekend! Is the boat show the best time to buy a new boat? Do I really need to buy a boat in the middle of winter when I'm not going to be boating for another 3 months? Should I go to the boat show if I am starting my search or not going to buy this year? We get these question a lot and the short answer is YES. There are many reasons to attend the boat show but today I want to share the top three. Dealerships travel from all over the state to be at the Grand Rapids Boat Show. This results in all different types, styles, and brands of boats being on display. If you don't necessarily know what you're looking for, are new to boating or just starting your search... this is the perfect opportunity for you to explore! Have a better idea of what you're looking for? The boat show is for you too! The show provides a unique experience in which you can see everything in one place and in one day. Outside of the boat show, shopping different brands and/or styles of boats can be time-consuming. Driving from dealership to dealership can result in hours of traveling and even time off work. After doing your shopping and narrowing it down to a few options the boat show allows you to quickly revisit your favorite dealerships and boats. Revisiting your top picks ensures you have all the details and allows you to ask any questions or about any concerns that may have come up while shopping around. This is also a great opportunity to collect brochures, contact information and quotes if you hadn’t had the chance to before. Boat show season is the time of the year that dealerships have the most in-stock inventory. Have a particular color, layout, or size in mind? Now is the time to buy. Large inventory means more to choose from. In return, this means you will have a better chance of finding exactly what you're looking for. As summer approaches, dealership’s inventory will start to diminish. Wait too long and you may find yourself having to make compromises. 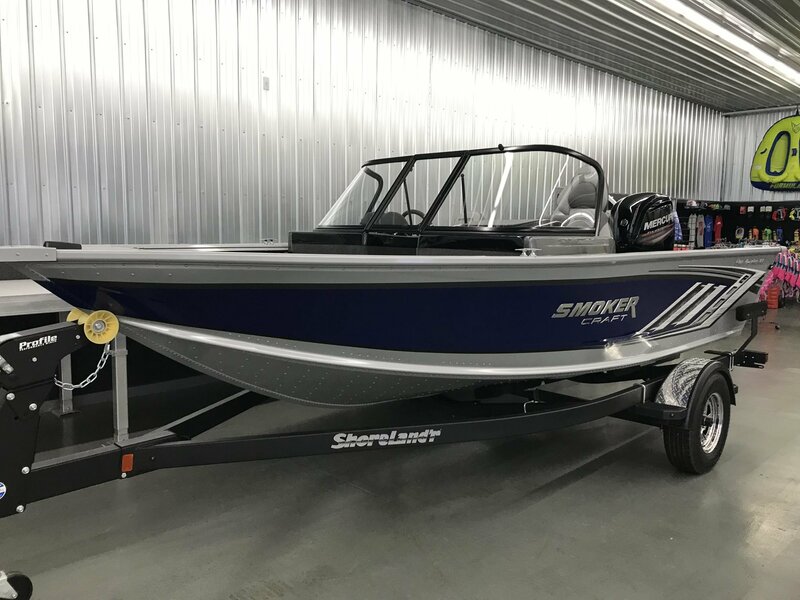 Buying an in-stock boat also ensures an early spring delivery and a full first season of fun on the water. 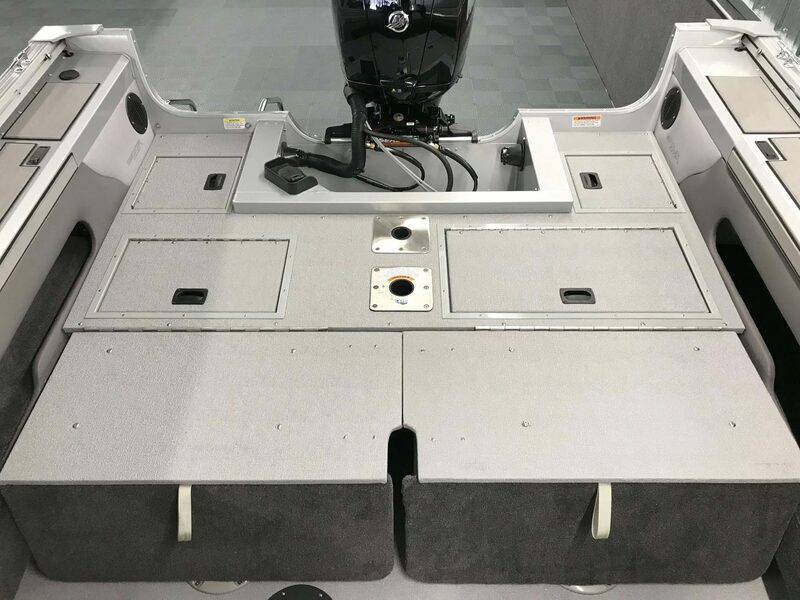 Having a hard time finding the perfect boat or pontoon in a dealerships stock inventory? You may want to ask about custom ordering one. By this time of the year, most people have already custom ordered a boat for spring delivery. But don't worry, it may still be early enough to expect a mid-summer delivery! It is also a good idea to ask the dealership's staff if they have any remaining build slots for custom ordered boats. At the boat show, most all manufacturers and dealerships provide incentives to purchase. These incentives can come in the form of an extended warranty and/or a price discount. And in some cases, these incentives can result in the best pricing of the year. If you have plans to finance your new boat, the show is a great time to snag a reduced interest rate too! Most banks allow dealerships to run reduced rates for the boat show. So be sure to get your deal locked in and get your finance application filled out. Keep in mind, most reduced rates are only good through the end of the show. Don’t be afraid to ask dealerships staff what the incentives are to buy at the show. Ask if any incentives discussed have a limited quantity. Ask what the price would look like if you should decide to buy at a later date. Inability to answer these questions might be a red flag! Premier Motorsports has been attending the Grand Rapids boat show for more than 20 years. We now have one of the largest booths in the show and will have more than 30 boats on display again this year. Come and warm up with team Premier this February with a trip to Devos Place! You'll thank yourself this summer while you're relaxing on the lake with friends and family.